Homeschooled kids think different. Granted, in some regards, kids are kids everywhere. But I can recall several field trips where their collective out-of-the-school-box mindsets have spontaneously combusted to the bewilderment of docents. 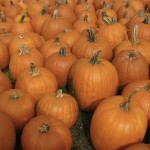 In Maryland, October is the month for corn mazes and pumkin’ chunkin’. Local agri-tourism farms make their field trip nut in the Fall to last all year. A group of us, about 30 moms & kiddos, were getting the 10-cent tour, ending with pumpkin demolition. The farmer was explaining how the slingshot device worked. We encircled her at the wide-open barn doors to watch. She had two Moms hold the side handles and she loaded up a softball-sized gourd, well past its prime, pulled back the glorified rubber band and let it fly. The pumpkin smashed into the square hay barrels stacked 50 feet away. Bull’s-eye. Obviously, she’d done this before. Without hesitation or discussion the 20-some kids each found a place along the knee-high hay barrel wall at the barn doors where the slingshot had been demoed. You could see the confusion on the face of our farmer. Obviously she meant a long column, snaking back well into the middle of the dark barn, with just one child at its head. You know, the way school kids line up by the classroom door to go to assembly. No butting! But how could anybody near the back of that kind of line see what was going on with the pumkin’ chuckin’? By forming a row across the straw wall, everybody could catch the action, cheer on their friends and have a turn without there being a linear “first.” The docent shook off her momentary befuddlement and went on with her scripted routine.